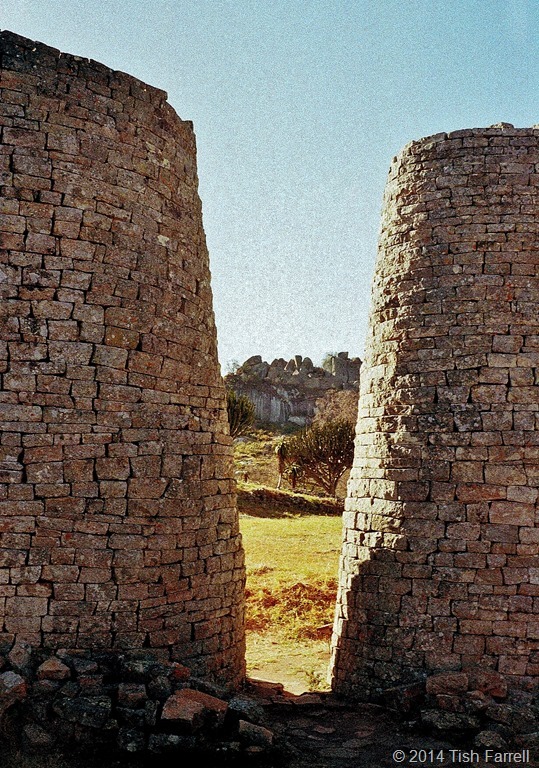 Posted on March 3, 2014 January 21, 2018 by Tish Farrell	This entry was posted in African History, Archaeology, photography, Travel, Writing and a Sense of Place and tagged #amwriting, Great Zimbabwe, postaday, Shona, Swahili city states, Tish Farrell, Weekly Photo Challenge, wplongform, Zimbabwe. Bookmark the permalink. Fascinating history, Tish. If we only had a time machine to find out what really happened! Yes, if only we did! Tish, first shot is one heck of a brilliant great shot!! Well thank you, Hanne. I’ll tell Graham. He was using my little Olympus trip. Do! 🙂 it really is stunning, the colors, the depths and the heights. Another great read, Tish. Never been up to Zim, must be honest. Let’s hope when Uncle Bob shuffles off, places like this, along with the rest of the country, will enjoy a revival of good fortune. Yes, indeed. It’s a beautiful country with lovely people. It’s a shame, when Uncle Bob started off so well. Thanks for your comments, Ark. Thank you for sharing your great research to the history of the ruins of Great Zimbabwe! I loved visiting these ruins in 1988. I felt something very special there. Yes, it definitely is an extraordinary place. We were there in winter (July) and the afternoon light was fantastic. I only wish I’d taken a few more photos. Thank you for sharing. This is very informative. This is about as fascinating as there is. Thanks for sharing your photos and knowledge of this civilization with us. Very interesting, Tish. 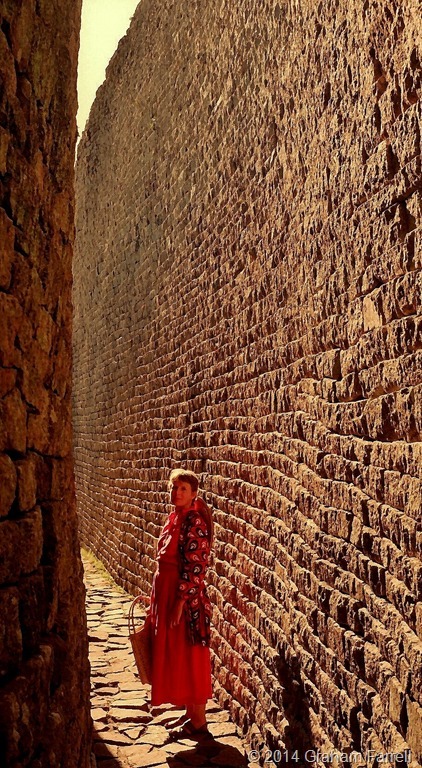 I like all the shots of this amazing place, but the first one is really well-done, with the height of the walls against the small human. Beautiful color, too. A brilliant read, Tish. I was that engrossed. Fascinating history. Thanks, Celestine. I got quite engrossed myself re-reading about Great Zim. Enigmatic…I wonder what really happened. They don’t know about Machu Pichu either for example. Yes, it is mysterious – and in both cases – to apparently leave behind a city that had taken massive effort to build. It’s a fascinating tale, isn’t it, Tish? Sadly Mugabe and all that came after has overshadowed the historic details. A fascinating story of which I previously knew nothing – what a great mystery. Yes, so much of Africa’s history and prehistory is either lost or unknown. In many places it wasn’t convenient to white settlers that it should be known. Thanks for sharing Tish! The pictures are simply amazing! I wish I could be there, touching the walls, and reveling in the beauty and history at hand. You’ve sprung a memory with your words, Dr. Y. I remember standing outside the Great Enclosure, talking with a friend who was travelling with us. He didn’t seem keen to explore, and I was feeling frustrated at his lack of curiosity and wonder. I was trying to extricate myself from what I thought was time-wasting chatter, and pressed my palm to those sun-warmed walls, just to feel something of their wonder. One of the world’s very extraordinary places. AMAZING! Thanks for sharing with us Tish, you gave us, through your pictures and words, a taste of Great Zimbabwe, a great ancient kingdom of Africa. Yes, and I wonder how many more great kingdoms there were that we know nothing about. A very good post Tish. Thank you. 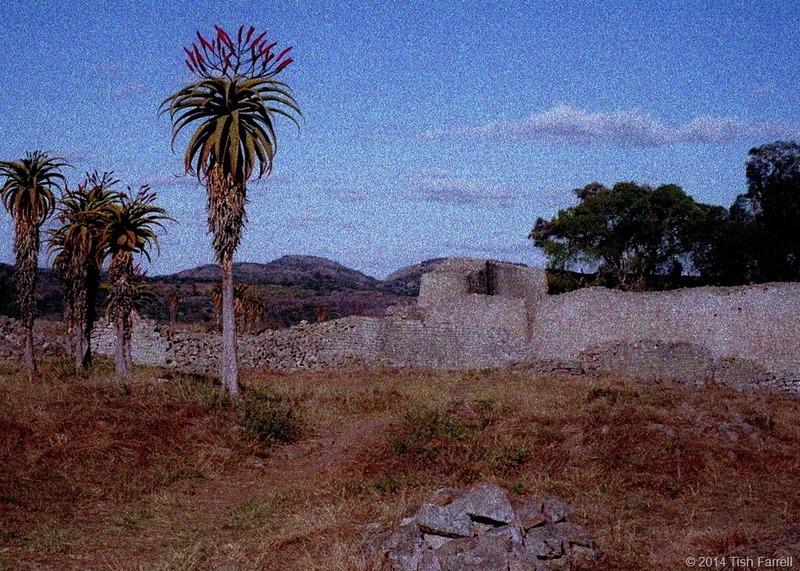 It was a very wonderful trip in ’93, Great Zimbabwe not the least of it. 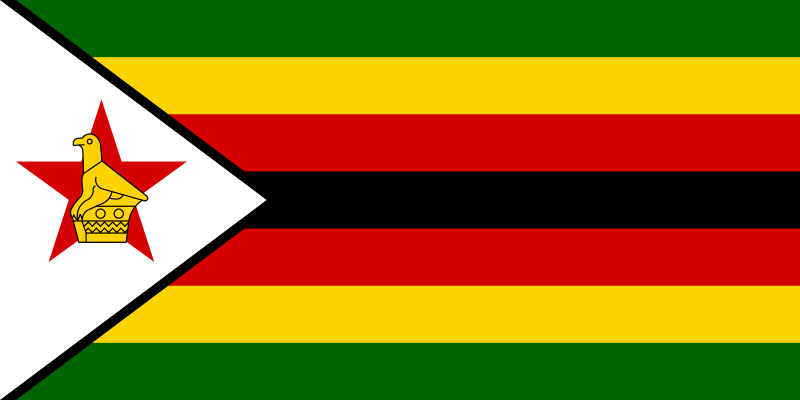 Let’s hope Zim will now return to its former glory. So much potential there and with such bright people, and also a very beautiful country. Haha! Sense of humour at its best. That’s an interesting question, to which I have no answer. 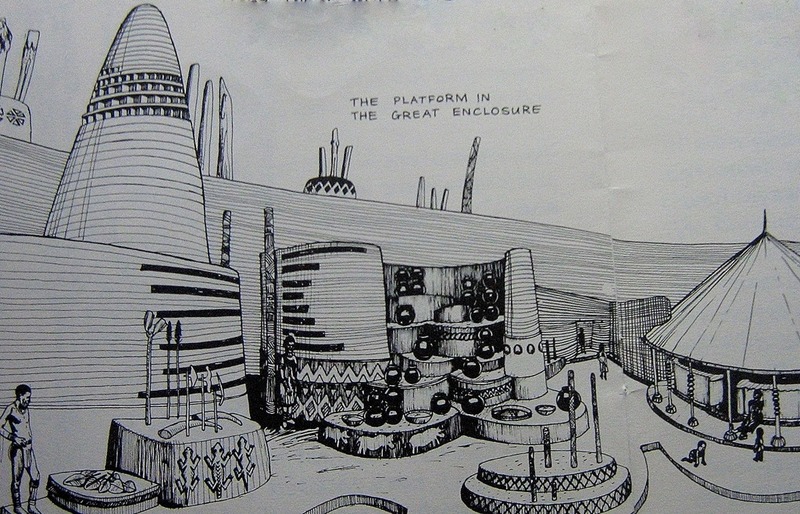 But one possible notion might be that there was no divide between sacred and profane in traditional culture, so that the Great Enclosure was of spiritual as well as temporal importance. It’s rather womb-like now I’m thinking about it. 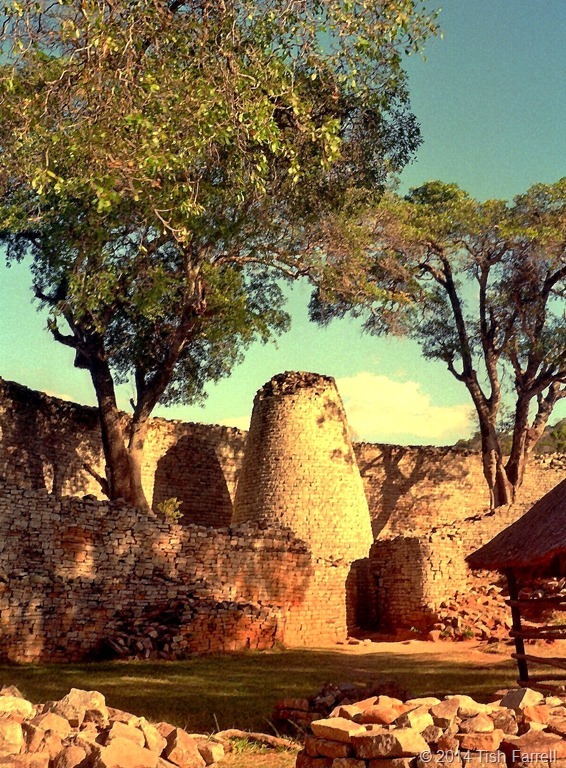 Remains of this kind of monumental stone building are found all over Africa, not only in Zim. In Kenya I think there are ruins dating from around the 17th century. We know so little about precolonial history when it comes right down to it.